I might have missed some days in history class in high school, but I don't remember Thomas Jefferson ever telling you, "You can take that arrest warrant and shove it up your Communist *&%*." A year or so back, the Virginia General Assembly stopped appointing new judges. Budgets were tight and this was the hit that the third branch of government was going to take - no new judges for two years. It wasn't a perfect resolution and, as judges were forced to retire at 70 or left for other reasons, all of us out here in the trenches started to fuss. Some, maybe even most, of this is white noise - the typical reaction of anyone when they are told they can and shall do more with less. On the other hand, there are clearly circuits which have been heavily burdened by this situation. The most celebrated is probably the 11th Circuit where one juvenile and domestic relations court judge remains for the city of Petersburg and 4 counties. Another difficulty is the 30th Circuit which had an average caseload of 2,355 cases per judge commenced in 2009 (making its judges already the 3d busiest in Virginia) and lost one of its 3 judges in 2010. Assuming a fairly constant indictment rate, this means that the two judges remaining have an average caseload of 3,533 cases per judge commencing yearly.1 Comparatively, across Virginia the average number of cases commenced per judge in 2009 was 1,837. These difficulties have led to the governor proposing the adding of money garnered from Virginia lawyers' dues to the general tax fund. Some also credit it as the cause of the attempt to redraw the lines for judicial circuits in Virginia. I don't know if the latter is true and rather hope that it is not because there are several circuits which could be improved if a common sense plan was put in place. (a) Prior to the commencement of a preliminary hearing in general district court or juvenile and domestic court, the prosecutor shall determine the sentencing range to be applied if the defendant is found guilty. This shall be announced to the court prior to the commencement of the hearing. If the mid-point of the potential sentence is less than 2 years the judge shall amend the case to an aggravated misdemeanor. (b) An aggravated misdemeanor shall be tried in the same manner as a class 1 misdemeanor. Should the defendant be convicted the court shall sentence the defendant to 2 years in jail and suspend such time as will require the defendant to be initially incarcerated for a period within the range of the sentencing guidelines. If the sentencing guidelines recommend the defendant receive probation the judge is not required to suspend the entirety of the sentence, but shall not require the defendant to serve more than 3 months in jail. (c) A defendant convicted of an aggravated misdemeanor has the same right of de novo appeal to the circuit court as a defendant convicted of a class 1 misdemeanor. In the circuit court sentencing guidelines (i) shall not be seen by the jury at any time, or (ii) the judge prior to rendering judgment and their use by the judge shall be entirely discretionary. (d) Aggravated misdemeanors shall be scored as though a felony conviction on future sentencing guidelines reports. (e) It shall be the duty of the Commonwealth Attorney in a jurisdiction to prosecute all felonies and aggravated misdemeanors. The second possibility would be to simply try non-violent felonies in the lower courts, without converting them into any form of misdemeanor, and allowing them the same right of "de novo" appeal as misdemeanors enjoy. This is more constitutionally chancy. Colten v. Kentucky seems to give misdemeanors tried this way the federal supreme court's imprimatur. I've never heard of felonies dealt with in this manner. However, the de novo trial availability allows the defendant access to a court of record and jury. I can't think of a reason (other than "OMG, you can't do that with a felony") why it would be logically different. The reason the General Assembly might want to do this so that it can have fewer circuit court judges. The general district court and juvenile and domestic court judges earned $16,000 less per year in 2008 (latest available figures). If circuit courts are only handling violent felonies, a few non-violent felonies, civil cases, and appeals from the lower courts their caseloads should drop significantly. I'd hope for at least a 50% drop.2 On the other hand, when the cases in the lower courts increase in number it should still be less work than there was in circuit court. There'd be no preliminary hearing. There'd be no wasted time with all the niceties of circuit court. Perhaps there would be a need for a third more gdc judges. I don't really see that jdr courts would need more judges. The number of circuit court judges would drop to about 80 (decrease of about 75), saving the Commonwealth about $11,850,000. The number of general district court judges would increase to about 170 (increase of about 45), costing the Commonwealth about an extra $6,390,000. The total savings would be about $5,460,000. I don't know what Virginia's annual budget is, but a $5 million saving is nothing to sneeze at in my book. In fact, I see this as a win all around. The General Assembly saves money. 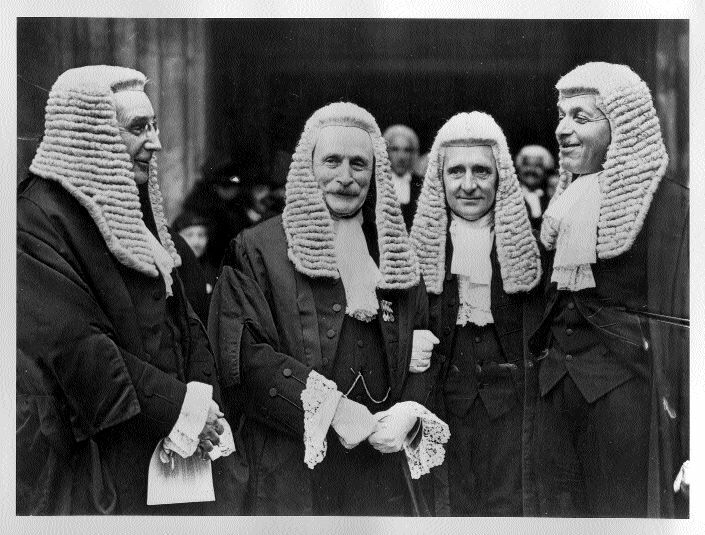 The lower court judges gain prestige from handling more significant cases. The circuit court gains prestige from being the place where only the truly serious cases are handled. LEO's and prosecutors are happy because they can take care of the minor thefts, frauds, vandalisms, etc. which are felonies more quickly than they can currently be dealt with. Some defendants also benefit by having most of their cases handled more quickly (mostly those who would get probation or weekend jail or home incarceration or work release - nobody who is going to spend 6 months in jail is going to want to hurry his case). Even defense attorneys should benefit from this. 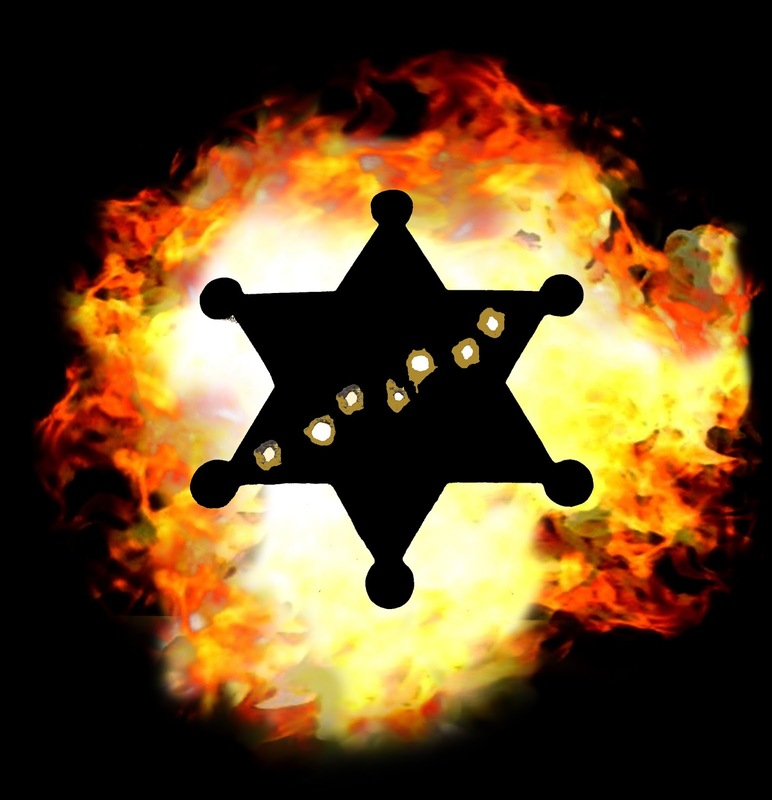 If they have one of those defendants who hasn't got a shot, the defense attorney can put on the big show in general district court where the punishment is limited in order to satisfy Unreasonable Defendant without exposing him to the greater dangers of either jury sentencing or a judge not bound by the guidelines. 1 Admission of potential bias: I practice in the 30th. I'm helping ProSe, who has a civil traffic case in Circuit Court, continue his case for a week because he has cases in General District Court tied to it and the witnesses won't be in the courthouse until that day. There's no problem with the continuance and, while we are still standing in front of the judge's bench, I turn to my right and start to tell ProSe he should go to the General District Court first because the witnesses will be there and the attorney who is handling the case should be there as well, but to make sure they all come to the Circuit Court to take care of this case. Me: "Mr. ProSe, you should go to the district court first. Technically, this is the superior court . . ."
"Yes, technically this is the superior court . . ."
I'm sitting in court and the entire day there's been a guy sitting in the front row with a ratty, old white t-shirt on with something scrawled on it which appears to be in black magic marker. I've spent a good portion of my day trying to get a good enough look to read it without staring at the guy. Finally, I make it out. This is a brilliant choice of wardrobe to wear when appearing before Her Honor. [addendum] The guy turned out not to be totally without common sense. Before he got called before the judge he found a coat to put on and button closed. Recall that I pointed out with interest the Virginia Supreme Court's decision 18 months ago in Whitehead. It was notable because it made a radical change to what the successful party at trial (usually the government) had to do in order to preserve an argument for appeal. The party actually had to make the same argument it made at trial in the appellate courts - exactly the same standard the losing party is held to by the Rules of the Supreme Court (but not the successful party). Even more interesting was when the Virginia Court of Appeals ignored the standard the Supreme Court had clearly set out. Finally, the Supreme Court got the case in which the Court of Appeals had ignored its standard - and it gave way. [U]pon reconsideration of the case law on this matter, we are of the view that this principle, adopted from Eason, is too broad and is inconsistent with case law that followed it. Failure to make the argument before the trial court is not the proper focus of the right result for the wrong reason doctrine. Consideration of the facts in the record and whether additional factual presentation is necessary to resolve the newly-advanced reason is the proper focus of the application of the doctrine. I have to admire the fact that the Supreme Court admitted it was backing away from its former stance. However, it does end two interesting issues: (1) Whether the argument had to be right, and (2) what the Supreme Court was going to do about the Court of Appeals ignoring its decision. Could I do it better? I followed the rules I set out yesterday. No less than three polities per circuit. No more than 5 polities per circuit. If one polity surrounds another they only count as one polity. Additionally, I tried to make sure each county seat in each circuit connected via the best possible road. Sometimes this was done serially. In other instances it was done radially with each seat being connected inward toward a point. Of course, it was impossible to do this perfectly, but I think I've done it better than either the current situation or the new plan discussed yesterday. By changing the circuits so that they are small enough to be manageable, I ended up with 26 circuits. This is 5 less than currently extant and 7 more than the proposed plan. I also fixed two problems with both the current circuit layout and the proposed one. The circuit in which Roanoke/Salem is in is no longer artificially small. 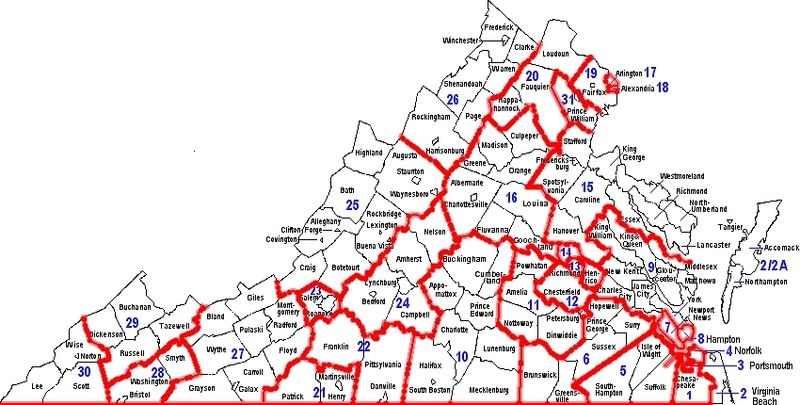 There is no reason for Roanoke county and the polities surrounded by it can't be in a circuit with 4 other counties. I also made the entire Greater Richmond Area into a circuit. By doing this 3 polities which are naturally tied into each other are put together. It also allows more common sense groupings of the counties around them. If the point is to make the best circuits possible, I think this is better than the plan which is being presented to the General Assembly. Will The General Assembly Make a Change? In principal, I agree with one of the major changes being made here: the elimination of single polity circuits. In fact, I think there is basically no excuse for the new 9th and 10th circuits. They should be merged and also have a couple counties from the proposed 8th added in. I realize that this means some judges from those jurisdictions would have to occasionally drive to another county, but that's why it's called a circuit - it's meant to be ridden. While I'm pointing out circuits which are too small, the 4th needs to take a couple counties in as well. The biggest failure of a circuit is if you make it too large. The old circuits failed this test in the 27th, 25th, 10th, the 16th, and probably the 15th. The new one will fail this in the 7th, 12th, 17th, and 19th. The main concern here is the travel of the judges. A judge should not have to start out in his county at one end of the circuit and have to drive over 90 minutes (max) to get to the court in the county at the far end of the circuit. In fact, it would be prudent to set a rule the circuits must have no fewer than three polities and no more than five. As well, if one polity is surrounded by another that should only count as one polity. This would get rid of the single polity circuits as well as keeping a group of more rural counties (where judges actually ride their circuits) from becoming too large. There are some strange things in the new proposal. For the life of me, I cannot figure out why Henrico, Richmond, and Chesterfield are not being made into a circuit. They compose the Greater Richmond Area and should be together. As well, I don't understand why Colonial Heights, Petersburg, and Hopewell aren't in the same circuit. Splitting three cities so close that they are called "the Tri-Cities" doesn't make much sense. I don't understand why the proposed 7th, 12th, 17th, and 19th aren't each split in half into smaller, easier traveled and easier managed circuits. I'm also confused as to what's going on in Southwestern Virginia. There's really no reason to mess with the current 30th or 29th circuits. They both are compact enough in size to be manageable. There is no reason to expand or alter them except to do it in order to prove it can be done. I think part of this may be an attempt to decrease the size of the current 27th circuit and the 27th does appear to be too large a circuit. However, the solution to that would be to have the 28th and the 23d, both of which are too small, absorb a couple counties each. 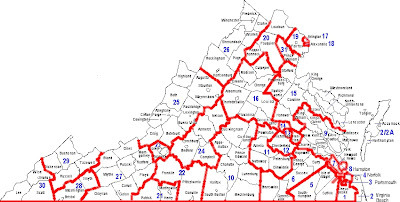 The proposed circuits for Southwest Virginia look a lot like they were drawn by Sykes-Picot. Someone just looked at the map and tried to draw as straight lines as were possible taking into account county lines. It doesn't seem to take into account where the roads actually are out here (as they wind around mountains) or the actual interaction of certain areas with others. It's also a little weird to see Buchanan County just kind of stranded there, mostly surrounded by the new 1st (which has snapped up two counties that fit better in the old 29th), but not a part of it. If the General Assembly were wedded to the concept of doubling the size of a circuit in the mountains, perhaps it would be better to make Buchanan part of the new 1st and Washington County part of the 2d. 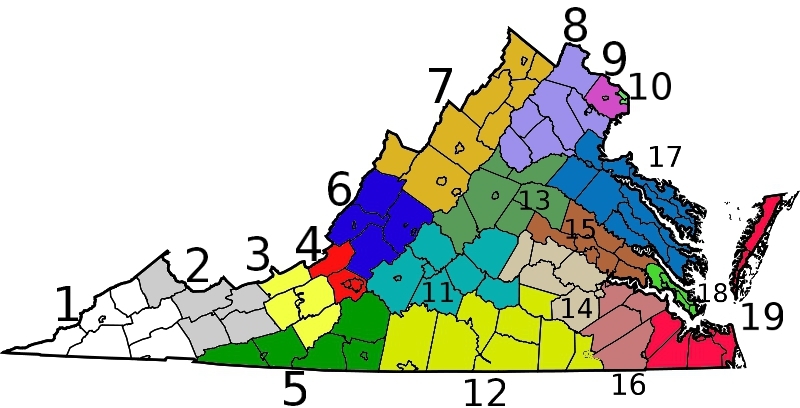 I realize that it's going to take multiple hours to drive from one end of the circuit to the other if Buchanan is included, but it's going to take hours to drive from Lee County (the county furthest west in Virginia) to anywhere but Wise and Scott Counties. If a giant circuit must be made it would probably be best to keep as much of the old 30th and the old 29th together as possible. Perhaps a more interesting thing to look at is how the judges will be allotted after the circuit change. Don't have time right now to try to compare that to current numbers, but it strikes me strange that the new 2d gets 4 GDC judges while the 1st only gets 3 GDC judges. I don't see how only 3 GDC judges could do the job in the new 1st. Obviously, this is merely a proposal which has been introduced to the General Assembly. It will be interesting to see how much it changes and whether it actually has legs. [addendum] The VLW has an article here. Well, it's been over a week since CES ended, so it's time for my yearly pining over the perfect tablet computer for lawyers. Last year, I think the Entourage Edge was the best I saw the tech shows talking about. This year there were also some dual screen tablets which looked impressive and had styluses. The Kno tablet looks like it would do everything I want. Of course, the problem is that it is over 5 pounds, which makes it impossible to hold and use comfortably. It's also too expensive. The actual range for tablets has got to be somewhere $500 or less in order to make it marketable - especially if going after the college age crowd which is already going to be brainwashed to want Apple products. The best for actual business use purposes is probably the NEC LT-W. Naturally, since this tablet is close to perfect, it isn't going to be in the U.S. at all. They're starting it out in Japan and it may come here if it succeeds there. The tablet without dual screens or stylus which seemed the most impressive was the Blackberry Playbook. It's impressive. However, Blackberry wouldn't tell anyone price or battery life. Since this does true multi-tasking its battery life will be terrible for those who can't remember to turn off apps (think of your buddies whom you can't get to turn things off in their Android phones and blame the phone for bad battery life). Sometime before the end of the year we are probably going to see a wave of Android pads which will seriously change the market. We are also going to see the next iPad, but if Apple follows its normal pattern, all that will really change on it are minor incremental improvements (probably cameras). Personally, I my dream machine would be a Kno that weighs 1.5 pounds, costs $300, and had e-ink on one side like the Edge. I know I'm dreaming, but that's the perfect machine in my mind. They actually do wear scarves. Okay, before watching this video I thought that the Doctor Who, British scarf thing was just a stereotype. I guess metro-sexuals aren't the only ones wearing them anymore. 5 second review: This is the funnest movie I've seen in years. 30 second review: A rich, useless guy, a Chinese wundermann, the world's most awesome car, and an extremely competent villain with an inferiority complex. Thus a superhero team is born. In depth: The Green Hornet fun, funny, and manages to hit all its plot points without bogging down or becoming brooding. Everybody in the theater (ranging from children through adult comic book geeks) was really enjoying it. For those of you who have never heard of the radio serial, the various comic books, or the TV show, the Green Hornet is a superhero. 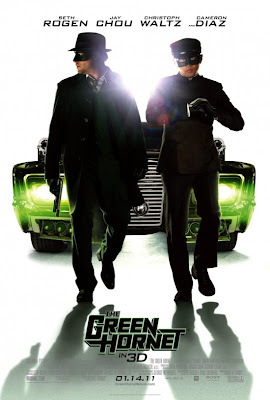 The general back story for all the Green Hornet incarnations is that Britt Reid, a newspaper publisher, takes on the persona of the Green Hornet in order to fight crime. What distinguishes GH from all the other mystery men and heroes is that he pretends to be a villain. A big part of the story is Kato. Kato has evolved. In the radio serial he was just Reid's driver. Since at least the 60's, when Bruce Lee played Kato on the TV show, Kato has been an amazing fighter. In this modern adaptation, Britt Reid is beyond being a ne'er-do-well. He is a hedonistic, moral tragedy. In other words, he is living the life most guys dream of. He has more money than he can ever use, has absolutely no responsibilities (his father runs the paper), and dozens of beautiful women are willing to sleep with him whenever he wants. Then his dad dies. What follows isn't the typical creation of a hero theme. We don't get the troubled cry for vengeance, the brooding troubled transformation into a driven man. Nope. We get Reid and Kato bonding over what an @sshole Reed's father was and mutually deciding to go do some childish and stupid vandalism. They trip over a mugging and stumble into becoming heroes. Meanwhile, the TV news vilifies them for the vandalism. Reid decides to go with it. He talks Kato into it. Reid uses his paper to play up GH and gives Kato a blank check. Kato builds the Black Beauty, a car which makes the batmobile look wimpy, and provides the muscle and fighting skills when it comes time to fight bad guys. What makes the movie different is that for the vast majority of the film Britt Reid is an immature idiot. He became a hero out a childish impulse. He treats everyone and everything around him as a toy. He uses the the newspaper he inherited to make the GH famous. He throws money at Kato so he can create all the GH's gear. He gapes in amazement at all the wonderful toys Kato makes for them and denigrates the fact that all the serious fighting is done by Kato. In fact, his immaturity starts to make it all fall apart. Then, something happens in which reality slaps Reid in the face. He steps up and makes a mature decision not having to do with the GH. That action leads to an extended, well-done battle over the last half hour of the film. It's different from most hero movies and that's what made it so much fun to watch. I rate it a 4 out of 5. The only critique? It shouldn't have been in 3D. If you can avoid seeing it with the stupid glasses on, do so. It added nothing but annoyance. I think I fixed "that badge thingy" on the left so that it doesn't cover any text on any of the major browsers. The badge thingy is up because CrimLaw has just started its 9th year of existence on 12 January. Yes, I know it looks goofy, but I like it (until it gets old in a week or so). A few months ago, a local judge started adding conditions when sentencing a defendant that require the defendant, while on probation, to only use one local pharmacy and only go to one doctor (except in emergency or if referred). This was in reaction to the fact that our major drug problem is prescription drugs. Seeing a good idea, I did what any good lawyer does, I plagiarized it was inspired by it. I added my own version of the same requirements to my plea agreements. Defendant: "One doctor and one pharmacist?" Attorney: "Yeah, they're putting that in all their plea agreements 'cuz of the pills." Defendant (with wonderment in his voice): "They're just not gonna let us get away with anything anymore, are they?" (1) That may be nicest looking exterior I've ever seen for a jail. (3) The Commonwealth Attorney's office in Lexington has some nice looking young ladies working in it. Almost makes me want to move back to My Olde Kentucky Home and take up crimlaw there (almost). SCOTUSblog is a great site which follows the U.S. Supreme so closely that I'm surprised that it doesn't tell us what the Justices eat the mornings that they hear arguments. I just went through and looked for the big crimlaw cases for the year that will affect Virginia and other States. After each case I will put my gut reaction (without any actual research on the issue). Michigan v. Bryant - Is a declaration made by a person who is injured, and probably dying, admissible without the declarant testifying? Reaction: I think that as constitutional interpretation currently stands testimonial statements shouldn't be allowed unless the defendant killed the victim to keep him from testifying. However, there is also the concurrent issue of whether something is testimonial or not, as determined by whether it was an emergency plea for help concurrent with an ongoing dangerous situation or a statement meant to result in the arrest and prosecution of the offender. This test is entirely situational and I don't see how the Court could change this unless it went back to the pre-Crawford fiction that fulfillment of hearsay rules satisfies confrontation. Connick v. Thompson - Can a prosecutor's office be held responsible for the bad acts of a single prosecutor in a single instance because of its inadequate training? Reaction: I listened to the oral argument in this case and the Justices seemed very hostile to the plaintiff. The Justices kept wanting to talk about sufficiency of the evidence (phrasing it several different ways) and the plaintiff's attorney kept tactfully telling them that is not their business; the jury decided facts. I don't know what rationale the Court will use, but I'm pretty sure they will find for the prosecutor's office. Premo v. Moore - If a defendant pled guilty can he raise a habeas based upon the allegation that his attorney should have moved to suppress his confession? Reaction: Before answering this question, I'd want to know if the possibility that the confession could have been suppressed was used in the negotiations to get the defendant a lesser sentence. If not, (1) should the statement have been suppressed, and (2) would the confession not have been redundant? Cullen v. Pinholster - Can a federal court overturn a state court conviction on the basis of facts the defendant did not allege in state court? Reaction: Not unless the evidence (1) was not, and could not have been, discovered prior to trial, or (2) the defense attorney was incompetent and lazy and just didn't do his job. The defendant shouldn't be rewarded for making the tactical decision not to introduce evidence or to remain willfully blind as to evidence. Wall v. Kholi - Is the one year limit in filing a federal habeas tolled by a defendant's state court motion to reduce his sentence? Reaction: If the motion to reduce was based upon grounds which could have been raised on appeal, yes. If the motion to reduce was based upon the Big Four, no. Walker v. Martin - If a defendant could not file a state appeal because he "substantially delayed" his appeal, can he still file a federal habeas? Reaction: No. Well, not unless he can show the failure to file was the attorney's malpractice. Kentucky v. King - What are the limitations on an officer's ability to create exigent circumstances and thus not have to get a warrant? Reaction: Huh? Create? If you mean do legal things which reveal illegal things, no limitation (knock and talks, consensual conversations, etc.). Bond v. U.S. - Can a defendant challenge his conviction on the grounds that the Congress has violated the 10th Amendment in passing the law? Alford v. Greene - What must the government do before it can take a child who is in school in order to investigate child abuse? Reaction: Why is the federal Supreme Court dealing with this State issue? Camreta v. Green - What circumstances require the police to get a warrant before questioning a child about sexual abuse? Reaction: The federal Supreme Court reslly, really wants to deal with this issue. Bullcoming v. New Mexico - Can a supervisor who did not prepare a certificate of analysis fulfill testimonial obligations in court? Reaction: No. You don't have to drag all the technicians in who run the analytical machines, but you have to have the person who actually interpreted/analyzed the information which came from the machine and filled out the certificate. Tolentino v. New York - When police violate the 4th Amendment in order to get pre-existing documents concerning the defendant must the documents be excluded? Reaction: Yes, but the Court is so hostile to excluding evidence that it will probably come up with some sort of pretzel bending sophistry to come to the opposite conclusion. Davis v. United States - If police acted in good faith, pursuant to legal precedent, in executing a search, must the fruit of the search be excluded if precedent changes to make the search unconstitutional? Reaction: It is unfair to the police, but if a decision results in the exclusion of evidence in the case appealed it should also result in exclusion in all other pending cases with the same issue. JDB v. North Carolina - Can a court take into consideration a child's age in deciding whether the child felt she was free to leave during police questioning? Lafler v. Cooper - If a defendant went to trial in state court and was convicted, can he base a federal habeas petition on the allegation that his attorney deficiently advised him to refuse a favorable plea agreement? Reaction: Yes. The question is how you prove deficient advice in the rejection of the plea agreement. Plea agreements are usually going to be better than the result of a lost trial. Therefore, the test cannot be whether the trial got the defendant a worse result. There'd have to be a presumption that the decision to reject was a tactical trial decision. Missouri v. Frye - Can a defendant raise a federal habeas based upon the allegation that his defense attorney failed to tell him about a better deal than the one he got? Is there a remedy for pretrial failure of the defense attorney if the actual courtroom procedure was valid? Reaction: Yes, if the appellant can actually prove he wasn't told of the deal. As lawyers in Virginia, we are regulated by a monopolistic state agency and have to pay a special tax every year for the privilege of continuing to be an attorney in good standing. That's the reality of our situation. However, we don't like to think of our situation in those terms so we cloak it by thinking and speaking of it as paying dues to our professional organization. Nevertheless, there are times when the reality is brought home forcefully to us. When money became tight, one of the money saving measures which the General Assembly and the Governor applied was to put a two year embargo on the replacement of judges when a sitting judge left his position. Supposedly, this saves the Commonwealth $250,000 a year per non-sitting judge. Per Article VI sections 7 & 8, it is questionable under the Virginia constitution whether the General Assembly is allowed to do this; language in both sections states that judges "shall" be chosen by the General Assembly without any language allowing the General Assembly to duck this requirement. However, a constitutional challenge is unlikely because the General Assembly clearly has the ability to create or eliminate judicial positions and, if forced to act within its constitutional mandate, could start permanently cutting judicial slots. That this didn't happen initially is probably because it would be politically difficult. After all, the places most likely to have more judges than they need are going to be the places with political pull. Technically, this is what the General Assembly should have done, but it ducked the difficult decision by merely halting appointments. Of course, anyone with a little clarity of thought can picture the results. Judges retire and judges quit. It happens all the time and usually it doesn't mean much except that the local Bar gets together and endorses a particular candidate and thereafter the General Assembly picks someone else entirely to sit as the new judge. Now, there are judges hitting the mandatory retirement age of 70 and others are quitting. Dockets are getting heavier. Judges are being made to run from courthouse to courthouse. The system is getting stressed. By report, about 30 judicial slots are currently empty. The worst case seems to be the 11th Circuit Juvenile and Domestic Relations court where "only one juvenile and domestic relations judge hears the cases in Petersburg and the counties of Amelia, Dinwiddie, Nottoway and Powhatan, with a combined population of 1.6 million." Of course, the problem in the 11th Circuit isn't only the size of the population, it's the distance between the five courthouses and the fact that Petersburg itself could probably operate a J&DR court five days a week all by its lonesome. It's probable that many rural areas are getting the squeeze as they had minimal judges to begin with and the absence of a single judge has much more impact on a circuit with three judges in three counties than the absence of one judge has on a city which has six judges in the same courthouse. The president of the Virginia State Bar placed the Bar in the middle of this argument, attempting to show the difficulties that the lack of judges has caused. The reaction to this was for the governor to propose $1.7 million from the budget for longstanding priority judgeships and simply take $5 million from the Virginia State Bar's money. According to Delegate David Albo, chairman of the House Courts of Justice Committee, the snatching of half the Bar's annual budget is being done to punish the Bar for lobbying the General Assembly on behalf of the Judiciary. Okay, fine, I had no delusions that the Bar, "an agency of the Supreme Court of Virginia" was an independent, non-governmental, self-governing, professional organization. It's less a guild than a governmental administrative agency setting out regulations and enforcing them. I've known as long as I've been a lawyer that the "dues" I sent in each year went to the government. And, the Bar does seem to have more money than it actually needs at times - enough to attempt wasting it on social engineering which the Bar should not be involved in. All I can really ask is that the money be spent wisely. There's talk of funding "longstanding priority judicial vacancies." Of course, everyone will think that their jurisdiction badly needs the judge(s) of whom their circuit is short. If the General Assembly isn't going to fund all the judges, I'd ask for a few tests as to whether a judicial vacancy should be listed as a priority. 1. More than 25% of the judicial slots of a particular type (Circuit, GDC, JDR) are empty if the jurisdiction sits in 3 or more counties/cities. 2. More than 40% of the judicial slots of a particular type (Circuit, GDC, JDR) are empty if the jurisdiction sits in 2 or fewer counties/cities. 3. After passing through the first two tests, the circuits will be ranked in order of which has the largest number of pending cases per currently sitting judge in the type of judicial slot which is open. 4. Without exception, the slots with the highest ranked need are to be filled first. Why do it this way? Well, to begin with the first two tests are to take into account the fact that judges in multiple jurisdictions spend a lot of time traveling from courthouse to courthouse - often drives that take an hour or more. If forced to travel between courthouses in a day a lot of time is eaten up by this travel. On the other hand, judges in single jurisdictions, or even dual jurisdictions, go to the same courthouse every day and sit there all day long thus giving them the ability to handle more cases. Part three is just common sense. If each JDR judge in the 57th Circuit has 2,900 pending cases and each Circuit judge in the 96th Circuit has 2,400 pending cases the JDR slot in the 57th needs to be filled first. Part four is necessary. If exceptions are allowed they will become the norm. It is doubtful that Big City needs judges more the Rural Circuit, but it's a surety that Big City will have more political pull. And any competent politician should be able to come up with a plausible reason why his area needs the judge more. The moment you allow a single deviation from this plan it fails and you have only the places with political pull getting judges. Finally, I want to say that, unlike the newspaper editorials, I want to endorse the retention of mandatory retirement for judges at 70. I don't have a political reason for this; I have a practical one. We've all seen far too many judges late in their careers who are not doing a good job. Some are hampered by illness. Some are out of touch. Some haven't picked up a law book in 10 years. Some just don't give a dang. There are undoubtedly judges at 70 years who are razor sharp and completely up on each and every legal development. Unfortunately, I think the preponderance leans the other way. There's no shame in that; if I survive to 70 years I doubt my legal acumen will be as sharp as it has been. Yes, 70 is an arbitrary number plucked from the sky, but any number chosen would be and, unless we start retiring people when they fail some sort of aptitude test, you have to choose some number where believe you are doing more good than harm when you force people to retire. I think that 70 does this. Reworking the Circuits Could I do it better? Law & Order U.K. They actually do wear scarves.